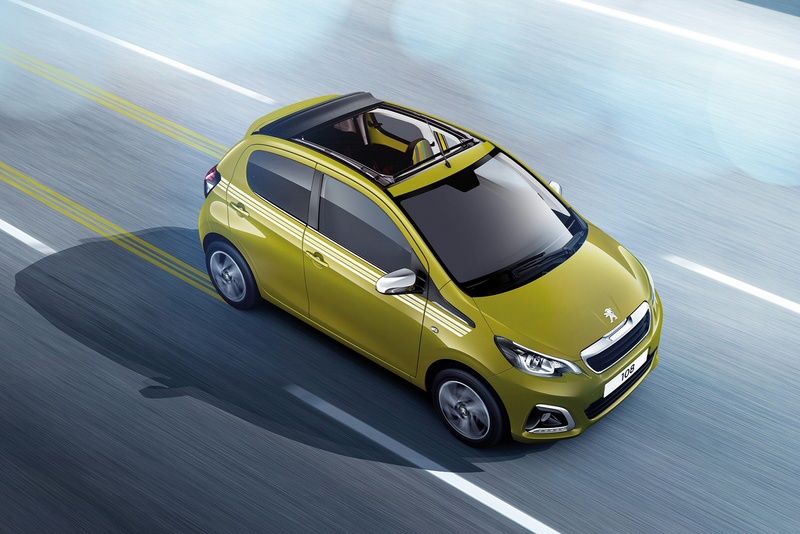 The Peugeot 108 hatch offers a 'convertible' version in the form of the 108 Top! Actually 'convertible' might be a bit of a stretch, as this one has a sliding canvas roof, but it still affords fresh-air fun at prices which start from just over twelve grand. If there's one thing that Peugeot's current range of models tells us, it's that manufacturing cars is often a cyclical business. Wind the clock back just ten years and there was barely a vehicle in Peugeot's range you could wholeheartedly recommend. The underwhelming 307, the over-achieving 206, the tired 406 and the baleful 607 were the backbone of a product line-up that looked doomed. These days, the Peugeot range is stuffed with talent, from the excellent 308 to the perky 208 and the clever 5008, this French company is in a real purple patch. When companies achieve this momentum, it tends to self-perpetuate, with young and exciting design talent queuing up for a chance to show what they can do. Peugeot's 108 citycar looks set to continue this rich run of form and in Top! cabrio guise, it once again demonstrates that Peugeot isn't afraid to do something fresh and funky. As you'd probably expect, this Top! cabriolet is mechanically identical under the bonnet to its hard top sibling. That means you get the Vti 72 Euro 6.d-TEMP engine now used across the 108 range, which comes with either a 5-speed manual gearbox or a (rather jerky) 2-Tronic semi-auto transmission. The auto variant will certainly suit urban-bound folk, people who'll appreciate the light steering and a kerb-to-kerb 10m turning circle so tight that even if you spot a parking place on the other side of the road, you may be able to throw a quick U-turn to snaffle it. When reversing into a narrow bay, it's almost comical how little car there is behind the rear seats and it's worth remembering that you can afford to leave yourself some breathing room at the back. Parking like this is especially easy thanks to the light power steering that'll twirl you easily into the smallest slot. A lot of work has gone into making the 108 a livelier drive without compromising on quality feel. The suspension has come in for a lot of attention. Where the old 107 was a bit bouncy, Peugeot has tried to engineer in a level of suppleness that's more befitting of a bigger car. To that end, the 108 gets upgraded suspension springs, higher spec shock absorbers and a bigger anti-roll bar to help body control in corners. Of course, the big draw with this model is the fabric roof. Citycars like the Smart Fortwo Cabrio and the Fiat 500C have shown that there's a real demand for urban tots that can open up for the sun and the 108 Top! doesn't attempt to do anything too radical with its roof. You won't find a fiendishly clever and complicated folding hard top. Instead there's a set-up that's more akin to that used on Fiat's 500C. So you still get the sides of the car left intact, which helps with the vehicle's structural rigidity, the fabric roof sliding back electrically, folding neatly as it goes. We can't think of another such small cabriolet that is offered with a choice of three and five-door body styles. The interior of the 108 hinges around a 7-inch centrally mounted touch screen system. This display is optional on the Active trim level and standard in the Allure and it really brings the interior together, so you'll be missing out of you pinch pennies here. It controls the car's media, trip computer, Bluetooth and various vehicle settings. Should you want to personalise your 108, Peugeot offer seven different themes which feature decals, trim inserts, and seat fabrics like houndstooth and tartan. The Top! body style comes only with the five-door body shape. You'll need just over £12,000 to land the entry-level 1.0-litre Active 108 Top! There are plusher 'Allure' and 'Collection' trim evels if you want and if you avoid base 'Active' trim, you'll be offered the chance to specify '2-Tronic' auto transmission too. Recent technology enhancements include a new and improved capacitive colour touchscreen with Mirror Screen, Apple CarPlay and Android Auto connectivity, putting functionality at the driver's fingertips. Mirror Screen allows the driver to display compatible apps on the 7" touchscreen and manage them using the vehicle controls. The touchscreen is available as standard on Active trim level and above and comes with DAB Digital radio, USB / 3.5 mm Jack for external audio devices and gloss black surround. Safety equipment shouldn't be an issue as even the entry-level car is fitted with Hill Start Assist, anti-lock brakes, emergency collision braking system, and electronic stability control. There are full length curtain airbags, two side airbags and two front airbags. Both rear seats are also fitted with ISOFIX child seat mounts. Even if you aren't the least bit interested in the sliding fabric roof, you might well have been thinking that the 108 Top! might just make a smarter buy than the standard car thanks to beefier residual values. We're not so sure about that. The price premium over its hard top sibling is over £1,000, so it has further to fall. Were it priced around £500 above the standard model, it would certainly be a stronger residual choice, but the ownership price premium leaves little doubt that the soft top will work out more expensive to run over a typical three year ownership period. Day to day costs are kept well in check. You're looking at a combined fuel economy figure of 68.9mpg and emissions of 93g/km. The car is available to purchase with 'Just Add Fuel', Peugeot's innovative finance package which offers three years' insurance for up to three drivers, car tax, warranty, road side assistance and routine servicing - all for one fixed monthly price. If you�re looking for a new Peugeot 108 1.0 72 Allure 5dr 2-Tronic Petrol Hatchback for sale, you�ve come to the right place. At Bristol Street Motors we don�t just have the best Peugeot 108 1.0 72 Allure 5dr 2-Tronic Petrol Hatchback deals, we also offer friendly advice and help with all your enquiries to ensure your buying experience is a happy experience.